Whether you are considering remodeling your home, building a new home, or you are a local contractor/builder looking for top quality doors, Peninsular Lumber, Tampa’s Therma Tru Doors premium dealer has unparalleled experience in providing the perfect look, fit and feel for any home. According to Remodeling Magazine, replacing your existing exterior doors ranks as one of the top 5 returns on investment (ROI). For Therma Tru Doors in the Tampa area, we encourage you to come to our custom door showroom to find the right Therma Tru Door for you. As an innovator in our field for almost 70 years, Peninsular Lumber’s line of Therma Tru Doors not only add style and character to your home, they also provide energy efficiency, superior security and low maintenance requirements. Over 80% of Therma Tru Doors are energy star qualified, insuring your new doors have superior energy efficiency, potentially saving you hundreds of dollars throughout the lifetime of your home. In addition, when remodeling your primary residence, choosing one of the energy star qualified doors through Therma Tru Doors may enable you to claim a tax credit. If security is important to you, we encourage you to visit our Tampa Therma Tru Doors location at 4812 N. Grady Avenue, just west of Dale Mabry and a couple streets south of Hillsborough. 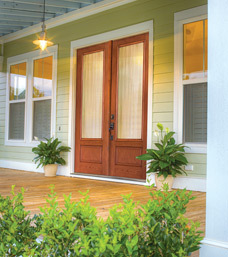 Our entry and patio doors have a proprietary security system built into each door. A multi-point locking system engages locks at different points on the frame and the adjustable striking plate provides 3 times the resistance to force than standard striking plates from other manufacturers. Designed to withstand Florida’s hurricane force winds (up to 450 lbs of force), Therma Tru Doors keep your home safe and secure from the elements. 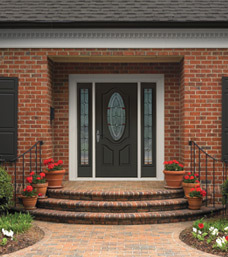 A pioneer in creating the first fiberglass doors in 1983, Therma Tru Doors continues to redefine their industry and set the standard in engineering excellence and design. 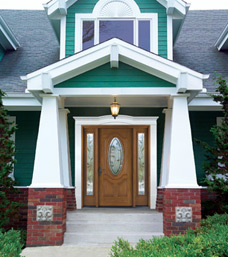 Fiberglass doors are durable, yet easy to maintain and clean with just soap and water. With almost unlimited choices to match the look and feel you desire, Peninsula Lumber of Tampa and Therma Tru Doors have the expertise to guide you through the decision making process whether you are remodeling, planning new construction, a trusted contractor or new home developer. Give us call us at 813-875-8805 or use our contact form to ask us your questions. We’re here to serve!